As we prepare to read MR James's short story 'The Stalls of Barchester Cathedral', here's some brief biographical information on him taken from The Oxford Companion to English Literature. Montague Rhodes James (1862-1936): Born near Bury St Edmunds, a brilliant linguist, palaeographer, medievalist and biblical scholar, was successively provost of King's College, Cambridge and (from 1918) of Eton. His memoirs, 'Eton and King's', were published in 1926. He edited works by Le Fanu, whom he greatly admired, and himself wrote several volumes of distinguished ghost stories, many with East Anglian settings, including 'Oh, Whistle, and I'll Come to You, My Lad', which appeared in 'Ghost Stories of an Antiquary' (1904). 'More Ghost Stories of an Antiquary' appeared in 1911, and his collected stories in 1931. The masterly combination of scholarly control and antiquarian detail with suggestions of underlying supernatural horror have made them lastingly popular. M. R. James's "The Stalls of Barchester Cathedrale"
After I finished "The Stalls of Barchester Cathedrale" last night I kept worrying I would see a cat if I looked round my living room too carefully. I was all alone; Jim had made a fire in our fireplace but had gone to sleep about an hour before. Isabel had put out the light in her room. I kept my eyes straight ahead of me as I drank the hideous concoction of konsyl in warm water I have every night of my life (well almost every night) since I was in my mid-30s, put out the Christmas tree lights (we have a small one), turned down the heat and went to bed. I also worried lest ever so quietly some part of a couch, say an arm, would silently became a claw and it get down on the floor and begin a trip across it. Montague Rhodes James was his name; his years were 1862-1936. As Sheridan Le Fanu and Bram Stoker for vampire tales; as Radcliffe for female gothic, so M. R. James for modern: it is his stories modern ghost and gothic writers have gone to when they want their tales to be read as not silly. Twentieth century writers of ghost stories have this problem you see. No one believes in ghosts anymore. At least not in public. Call God supernatural and people get nervous. The problem writers of the supernatural had and still have is the dissolution of religious and supernatural beliefs in Western culture, one which began in Trollope's time and is not coincidentally the time when ghost and gothic stories began to be popular; it is also not a coincidence that seances began to spread in this same era and the Darwinian approach gain real ground with educated people. The Edwardian era is the first high-water mark. Nowadays it ought to feel silly to try to scare people with owls and rotting castles. Pascal's "The eternal silence of the infinite spaces frightens me", an early reference to our sense of the great dark out there is what's want. Ours is a time of phones -- why didn't you just dial 999 when that vision appeared? So you must somehow or other reach for the repressed. James showed twentieth century ghost writers how to do it. I could reel off a litany of names of writers of these sorts of stories who have written how much they owe to James: H. R. Lovecraft is just among the most famous. Each term of the last three I have taught gothics and ghosts I begin with a film adaptation of of Susan Hill's novella, The Woman in Black (1986); the story itself is precisely in the manner of an M. R. James story: a slow gradual build up of atmosphere so that you feel yourself safe, secure, on utterly prosaic ground and then into this intrudes the ominous thing, unobtrusively at first, and it seems it is something you -- or the protagonist of the story -- called up. The title of one of James's most frequently reprinted stories is "Oh Whistle, and I'll Come to You, My Lad!" (1904). In the movie is the scariest image we see all term: a silent woman in a graveyard all dressed in black, on that river, her haggard hateful face over that man in bed, on the river, stealthily attempting to murder children to take revenge for one that was taken from her and died because she had it out of wedlock. It's like the cat in "The Stalls of Barchester Cathedrale." You keep nervously looking round lest she appear -- for when she does a child dies and it's often the child of the seer. There is not much outer life to talk about when it comes to M. R. He went from being a boy at Eton, to a schoolmaster there, time out for Cambridge (or was it Oxford? ), and then back to Eton as provost. He was an antiquarian who investigated manuscripts and did very respected work, a scholar. His degrees were in the classics and archealogy. He never married. No one has turned up evidence of a lover. In the 1880s he began to tell ghost stories at Christmas time, and soon he was asked to write them down. He kept up a prosaic front; the dream material of his life came out only through his stories. And they leave an impression: if you are not a reader, you have only to see a film adaptation of one and you begin to see what I mean. You do have to give yourself up to them, lend yourself to the spell, get to the point where you respond to the nuances. I find students who are poor readers and many young people who want some strong effect find James very tame. This past summer I read with them "An Episode of Cathedrale History," James's only vampire tale. Luckily the best student in my class, a young man who told me the first day he "really likes" Lovecraft (and was unhappy none was on my syllabus) chose it as the subject of his talk. I could see there were kids in the room who couldn't figure out quite where the vampire had been or what he did so very bad. Indeed there was no heightened theatrical vision anywhere to be seen or felt -- though there are allusions to Dickens's Mystery of Edwin Drood in this one, appropriate ones if you know that mysterious novel. James offends modernism too; he does not lend himself to the post-colonial crowd. There is no full sympathetic biography. Algernoon Blackwood with his wandering life, some of it spent in the streets, making money on radio, his clearly queazy sexuality is easier to write about in our time. I'll write about the story itself tomorrow. This was a most chilling tale told in a controlled manner, especially the diary entries. I printed this out and it looked so uninviting as something to read, small print on big pages, and I struggled with the opening. It grows on you though, (like a fungus!) and such is its power, the original crime seems quite unimportant in comparison with the horror of the retribution. Can I ask Judy G about the next read which offers two Stevenson's but the same URL for both (the essay). "This matter began, as far as I am concerned, with the reading of a notice in the obituary section of the Gentleman's Magazine for an early year in the nineteenth century". His interest in the venerable and awful pile under whose hoary vault he was so punctual an attendant, and particularly in the musical portion of its rites, might be termed filial, and formed a strong and delightful contrast to the polite indifference displayed by too many of our Cathedrale dignitaries at the present time". But, "how unsearchable are the workings of Providence!" It seems that just as "the honoured evening" of Dr Haynes's "life was mellowing to its close" it was "destined to be disturbed, nay shattered by a tragedy as appalling as it was unexpected. The morning of the 26th of February ..."
But our narrator breaks off here; we are getting ahead of ourselves. It seems he obtained and read materials in a box he found at the back of a shelf in the cathedrale library, a box the librarian told him an old Master said should never have been permitted to be in the library, and as long as he had control of it never opened. (He got these while researching into other manuscripts, college exercises, products of country clergymen, deceases professors with too much time on their hands, like epics on classical subjects in cantos.) Across the way from this scene Caldecott gives us a picture of a square handsome comfortable-looking stone building which reminds me of the red-brick building a group of us here on Trollope-l saw near Salisbury Cathedrale, one we were told was the original house Mr Harding lived in -- or if it wasn't was certainly the sort of thing Trollope had in mind. I believe Sig took a picture and Mike put it on his homepage. It is red-brick. We later learn that Dr Haynes had only become Archdeacon shortly before he died; only then was he given this house to live in. The previous Archdeacon has somehow slipped and fallen on the oak steps of the house. Everyone knows the oak is slippery; poor Miss Pultney and of course they'll get rid of the maid. Up to then Dr Haynes had been Precentor". People who have read _The Warden_ will recall that one of the last lines of the book has Mr Harding saying "Not warden now, only precentor". Trollope wanted to entitle his book, The Precentor. But instead of getting on with his box and story, the narrator proceeds to walk us about the cathedrale (also glimpsed in the above illustration, to the side of the house). Much of it is modernized (the choir "bare and odiously furnished"), but still if you search out you will find some older beautiful spots and objects: "a baldaccino of wood over the alter, with urns upon its corners", cherbus contemplating an altar screen classical in design, with a pediment enclosing certain Hebrew letters in gold. Now the story unfolds. It seems that having been promoted to Archdeacon, Dr Haynes starts to investigate things. (Always a bad thing to do in gothic stories; if find yourself in one, stay in bed.) He discovers that the dues the previous Archdeacon had collected for twelve years have somehow disappeared; there were no visitations, no reports; the chancels are past mending; one document about all this has a "rather cruel" Greek allusion to the Second Epistle to Thessalions. The Greek is hard to decipher; the King James has "what withholdeth;" the New English Bible translation is "the restraining hand." Paul's message is "you must now be aware of the restraining hand which ensures hat he shall be revealed at the proper time". Beware of what holds back from knowing. Literally the Greek verb means holds back or hold fast (a barrier or lock): the barrier is removed at last, which is what Dr Haynes is doing. It could also mean "holding fast" and "heaping up" which is what the Archdeacon did. 2 Thessalions says the world is about to end, but there is a restraining hand which prevents the apocalypse from being loosed upon the world; in a later passage Paul advises us to "stand firm brothers and hold fast". One is an exquisitely modelled figure of a cat, whose crouching posture suggests with admirable spirit the suppleness, vigilance, and craft of the redoubted adversary of the genus Mus. Opposite to it is a fearful strange looking King (it has a crown); from beneath its long robe we see prick-ears, curving horns, "talons of horrifying length and sharpness." Between them is a figure looking like a monk: the "head is cowled and a knotted cord depends from somewhere from the waist". "Slight inspection reveals a halter, sunken cheekbones and rent flesh" suggesting "the King of Terrors". "A very skilled chisel" did this: I suggest we are also to infer the figure could be of someone who was hung. In the next paragraph we discover the wood of which these exquisite figures are made comes from a Hanging Oak, and a "quantity of human bones was found in the soil about its roots"; it is also the sort of tree to which human beings would bring offerings, small images, puppets and hang them up in propitiation and in hope of "successful issue to their affairs." "almost overcome with sleep. My hand was resting on the back of the carved figure of a cat which is the nearest to me of the three figures on the end of my stall I was not aware of this, for I was not looking in that direction, until I was startled by what seemed a softness, a feeling of as rather rough and coarse fur, and a sudden movement, as if the creature was twisting round its head to bite me". At home he is continually pressed at. He hears low voices ("May I come in? "); sudden statements, some prosaic ("Let me wish you a happy New Year"), some not ("Take care"); he is aware of presences, conscious of something alive which shouldn't be, all around him, closing in; the wind itself makes noises. He works continually at his Defense of Episopacy; he knows that "work, diligent work, and a punctual attendance to the duties which fall to me is the best remedy". His sister returns; he grows more cheerful, but she does not stay. A badly spelt letter is in the box; the maid who was fired asks for £40; she and her man are in a bad way at the farm; she writes he owes it to her "Has you was the Means of me losing my place with Dr Pulteney". He wasn't, but there is a record of a payment of £40 made to the woman. He's not a nervous man, but the whispering in the house is now persistent. An entry reads: "The cat was on the stairs tonight. I think it sits there always. There is no kitchen cat." The reader is not surprised to learn "that the archdeacon's firmness" gives way; the narrator "omits as unnecessarily painful and distressing the ejaculations and prayers" which become increasingly frequent in the papers in the box. Jan 9 -- Allen thinks this is a noisy house. He thinks too, that my cat is an unusually large and fine specimen, but very wild." Allen says his wife would soon get all these servants in hand and then leaves. The humor is dropped and we are told of the Archdeacon's courage and determination. Entries are now "I must be firm" in a hand which digs the letters into the paper. The end is then told "in the polished language" of the first obituary: it records the horror of the servants who discover their master's body on those same stairs in a state which shows it was the "object of a brutal and murderous attack", the "vertebral column fractured in more than one place"; injuries on soft spots and opening "as if by the agency of some savage animal, which, dreadful to relate rendered those feature unrecognizable. Now the humor turns indirectly black: the writer reflects that the (radical) writings of Mr Shelley or Lord Byron or perhaps M. Voltaire were instrumental here. We then get a coda of the narrator's surmizes and his later investigation which I'll put into another post. Like many of M. R. James's stories, the explanation at the close is unreal, no explanation at all, not in the least convincing -- until at the end of the story you remember it as well as everything else. In the coda to the story whose tone is suddenly more prosaic, our narrator tells us (suddenly -- without any preparation) that he had of course formed the conclusion that Dr Haynes "was responsible for the death of Dr Pulteney." Haynes murdered Pulteney so he could be Archdeacon. There we are. Poetic justice. A savage God's in heaven; all's right with the world? Nontheless, satisfied as he is with this explanation, the narrator admits there are some "perplexing features" in these papers in this box. Take the carved figure of death (the narrator's interpretation of the king-like figure with the talons and long robe). Our narrator is bothered that he cannot substantiate that this figure was made from the hanging oak. This is weirdly hilarious: it has just the inconsequence of certain kinds of minds at loss. The obituary notice records the night of the attack as February 26th which was the date we started out with when our narrator broke off reciting the obituary. "'Oh, I forgot', said he. 'The old man told me it was so ugly and frightened his children so much that he burnt it'." The riddling allusion to the Greek Testament is significant. Dr Haynes is such another as was Mr Jennings, but this story is infinitely more carefully done than Le Fanu's. It must have taken loving care and many months. He is less of a victim than Mary since he chose the house, stayed in it -- and then there's the accusation. I don't believe it for a moment nor does it matter. We are to think that the Archdeacon was hounded in a manner similar to Dr Haynes but since he did not investigate and didn't seek to go beyond the barrier of this reality (was supine to parishioners too), he was left relatively alone. Simply bumped off, as it were, kicked downstairs. The accusation is a form of teasing the reader. Given all we know about Dr Haynes it is absurd. So too the blaming of the maid -- though we begin to wonder about who she is connected to, how. These are forms of teasing, like the explanation of green tea for Mr Jenning's experiences, though rather more transparently inadequate. I would maintain this: M. R. James meant the reader to believe in that cat. It was not just a figment of a mind gone awry. Why? Because what matters in this story is the ferocity on the other side of our comforting realities. There is the interesting question, just what did M. R. James expect his listeners and eventually readers to know. It's one thing for an Archdeacon to be able to recognize allusions to the Greek testament and take heed. James has these learned allusions in other of his stories. There's a riddling inscription in Latin in his "Oh Whistle, and I'll Come to You, My Lad" which has perplexed me and two students who had to do their talks on this story. I concluded it was a sheer tease as the narrator of this story couldn't make anything of it. But who knows? Oh how I love this kind of thing. Re: "The Stalls of Barchester Cathedral"
I must agree with Angela and Ellen about etexts of ghost stories - I also find they are not nearly so enjoyable as a book. Although of course it is wonderful that etexts have made so many classic works available, I do find the reading experience isn't quite the same. This seems to be especially true when it comes to Gothic and ghostly tales, which lose an element of their carefully-created atmosphere when read online. I read 'The Stalls of Barchester Cathedral' through the first time as an etext, after failing to find any MR James at my local bookshops, and was impressed but felt as if I was missing a lot. Then I tracked down a selection of his stories at the library, 'The Haunted Dolls' House and Other Stories', published in Penguin Classics, and read the story again. Immediately it seemed different and far more scary. The story just looks so much more enticing on the printed page, with different types for the diary extracts, letter and poem (ah, that poem... it is almost impossible to believe it wasn't really written in 1699) adding to the atmosphere. Having said this, I don't in all honesty feel this Penguin edition has much to recommend it, at £6.99 for only 16 stories with no notes and a very short introduction by Penelope Fitzgerald which doesn't go into much detail about the stories. I see from the Amazon website that there are at least two other editions in print which sound rather more tempting - an (almost) complete Wordsworth edition of 31 stories for just £1.50, or an Oxford World's Classics edition with 21 stories (including three later stories which aren't included in the Wordsworth edition). Oddly enough, neither my local bookshops nor the main Ipswich library seemed to have any ghost story compilations by various authors, or none I could easily find - the bookshops were swarming with Christmas shoppers so I couldn't really ask anybody. I loved the sound of the collections Ellen mentioned so will have to investigate further to see if I can find any of them. PS I'm hoping to send a longer posting about the story itself later tonight, once I've finished present-wrapping duties! This was indeed an eerie read. It sent me on to "Casting the Runes" ,the story that precedes it in my book. I doubt I'll be able to do more than this even in the morning. This man can really scare you! To Trollope-l: "The Stalls of Barchester Cathedral"
Many thanks to Ellen for the two highly stimulating postings about the MR James story, and for the Greek translation, which adds so much to the story. I very much enjoyed this chilling tale, if indeed "enjoy" is the right word, and am looking forward to reading more James. However, I have to say that my interpretation differs somewhat from Ellen's - or at least it did until I read her postings, which are now persuading me to rethink my approach to some extent. I read it that Haynes was indeed guilty of murder and that the fearsome shadowy form of the cat could possibly represent the hidden violent part of himself, returning to haunt him and trip him up, literally. Murder of course seems unlikely in this deceptively quiet setting, but I don't think we are left much possibility of a genuine accident. We are told that the stair-rod has been removed - and it later appears under the stair-carpet. This is surely not the sort of thing a ghost would do. The cat could just rush at the feet of the elderly Archdeacon and trip him - as in due course it it trips Haynes - without the need for any missing stair-rod. Later in the story, the maid's vaguely threatening letter, together with the evidence of regular payments, suggest to me that she knows Haynes carried out the killing - she hints that she has evidence. "you know best what I could say if I was Put to it but I do not wish anything of that unpleasant Nature being one that always wish to have everything Pleasant about me." In other words, she will go to the police unless the money is forthcoming, which it is. I also think there are oblique hints in Haynes's own diary that he feels a sense of guilt about the death of Pulteney. In the entry for November 15 there is the terse line: "Yes, mine is a heavy burden." This wording in itself suggests guilt, and is followed by the comment in square brackets "Then follows a line or two which has been scratched out. I fancy I read something like 'acted for the best'." How did he act for the best? By forcibly removing his predecessor so that he could sort out the financial tangles into which the cathedral had been drawn? "These words, *I must be firm*, occur again and again on subsequent days; sometimes they are the only entry. In these cases they are in an unusually large hand, and dug into the paper in a way which must have broken the pen that wrote them." That idea of "digging in" gives a suggestion of claws or talons, as if Haynes is being mysteriously taken over by the demonic figure of the cat, rather as Dr Jekyll is gradually taken over by Mr Hyde, or Ezra Jennings in 'Green Tea' dominated by the monkey. I was water'd wth Blood." For me this had an immediate suggestion of the crucifixion and also of pagan sacrifices. This hanging tree has demanded blood in the past and will demand more in the future. From all this, it seemed to me at first reading as if the cat represented the dark, hidden side of the apparently blameless Haynes, returning to haunt and damn him. However... After reading Ellen's persuasive postings, I have to realise that the idea of Haynes as a blameless victim, killed by the malevolent spirit which killed Pulteney before him, is equally possible, if not more so. The two men both die by plunging down the stairs, and, in each case, there has been some apparently malicious damage. When Haynes dies, the stair-carpet had been loosened. Cat claws could certainly loosen a carpet, even if they could not remove a stair-rod. "Allen thinks this a very noisy house. He thinks, too, that my cat is an unusually large and fine specimen, but very wild." It now seems to me as if, as with 'Green Tea', this is another deeply ambiguous story. The cat could be a creature of Haynes's guilty imagination, or a fiend (goblin damned) which destroyed Pulteney and goes on to destroy him too. The ambiguity comes across in a phrase like "I must be firm." How must Haynes be firm? In sticking to his story and hiding his guilt , or in maintaining his innocence and standing up against the forces of evil which are trying to destroy him? I was interested to see Ellen's mentioning that James refers to Dickens's Edwin Drood in another of his stories. This tale also reminded me of Drood in a way because it brings so much darkness and evil into what is an apparently peaceful clerical setting. Does anybody else have thoughts on this story? "In accordance with a fashion which has recently become common, I am issuing my four volumes of ghost stories under one cover, and appending to them some matter of the same kind." "Be careful how you handle the packet you pick up in the carriage drive, particularly if it contains nail-parings and hair. Do not in, any case, bring it into the house. It may not be alone... (Dots are believed by many writers of our day to be a good substitute for effective writing. They are certainly an easy one. Let us have a few more......)"
"I have heard that the present population of the Wailing Well field consists of three women, a man, and a boy." Read that without a cold chill running down your back! I have never regarded "The Stalls of Barchester Cathedral" as one of James's better stories. The Barchester connection is very thin - presumably Archdeacons Pulteney and Haynes preceded Archdeacon Grantly, although I would imagine that the future Bishop Grantly and Septimus Harding were already amongst the junior clergy of the cathedral. Trollope tells us very little about the fixtures and fittings of the cathedral, so that James's illustrations may well be right. I have always read the story as being quite descriptive of events that we are supposed to have assumed to have occurred. Dr Haynes used the maid, Jane Lee, to accomplish the death of Dr Pulteney, and he met his just deserts.. I cannot subscribe to Ellen's claim that 'Haynes was innocent'. She doesn't adduce any evidence for this, but as she says , "...nor does it matter." I have certainly found in her and Judy's postings a lot more to think about than I had done previously. But that's why I subscribe to the list. Re: "The Stalls of Barchester Cathedrale"
My evidence for the assertion that Dr Haynes did not commit any murder was my posting carefully tracing the story line and the character of the man: it is wholly out of character for Haynes to commit such a crime and the narrator's papers stress his character as well as trembling horror and nervousness. Judy, however, went over the tale bringing out some elements I had missed, and I have to agree with her that the removal of the stair-rod is not the sort of thing we associate with ghosts, and the sentence in the maid's letter which suggest there have been regular payments a line of history. It may be, as Judy says, "Mine is a heavy burden" is Haynes's rationale, though again in the story it seems (as the narrator tells it) that Haynes did not know the Archdeacon had been embezzling funds, not doing his duties, neglecting the church and the rest of it. Angela suggested Haynes's punishment was horrifically in excess of his crime: human beings don't torture people who are murderers. At any rate we are again left with a deep ambiguity -- as in the other tales of this type we've been reading. Another small element is how Dr Haynes resembles James in character and and the narrator too in type. In Braddon's story her young Mary is a version of herself. I don't see any direct connection between Mr Jennings and Le Fanu but in other of Le Fanu's stories the central protagonist and narrator dramatize aspects of Le Fanu's character and life history. I did see humor in this M. R. James story (the Allen episode especially); a kind of malign-trickster or mischievous joke goes on in this genre. We are really invited to get a kick out of these happening, in a way put in the position of the ghosts themselves. Jack Sullivan's Elegant Nightmares (a book on ghost stories) connects the core of these "things" (a word M. R. James uses in another of his brief prefaces) to other kinds of stories and texts. Thinking about the events of this year it seems to me that what I was trying to get at by the ferocity of horror on the other side of our comforting realities was also captured if articulated in a different way in the Robinson Jeffers' poem Mike put on our list on September 12th. I've not read that many of James's stories and don't remember them very well. Those I've read are very artful, lots of different nuances. E. F. Bleiler (editor of Ghost Stories of an Antiquary) says it is estimated that he catalogued between 15 and 20,000 medieval manuscripts. That means read, analyze to some extent, describe and give a number to in an arrangement which will make them retrievable for others. He was also the first person to produce a really modern (respectable, accurate, thorough-going) edition of the apocrypha to the New Testament. The apocrypha are mostly in Greek. This is a man who was a writing and reading and studying animal. We chose "The Stalls of Barchester Cathedrale" for the Trollope name in the title. Also it's online. What's online is the choice of the people who labour hard to put texts there, and often people choose a text out of what they've come across. That gets us to the reality of our dependence on anthologies. For reasons I certainly don't get I have come across James's "The Rose Garden" anthologized in a couple of places; it's tame. "Oh Whistle" is repeatedly anthologized and maybe overrated because of that. People go for "An Episode of Cathedrale History" because it's his one vampire story. Editors of anthologies copy one another (I could say plagiarize except it's not a crime when the piece comes from a work now out of copyright_). I discovered that when I went into the history of anthologizing of women's poems. It is probably a rare editor who returns to someone's original complete works to re-chose a fresh -- and maybe better -- text. "The Stalls of Barchester Cathedrale" is very short -- maybe the shortest of the group we chose. That could be another reason for its being online. I hope everybody had a good Christmas. In Suffolk we didn't have any snow on the day itself in the end, although we did have a sprinkling in the previous couple of days. In answer to Ellen, I would have to agree that Haynes's whole character works against the idea that he would ever consider murdering a frail 92-year-old man. I also think there is a strong suggestion that he could not be guilty in his reaction to the news of the death. "...there came a morning late in the year, when Dr Haynes, hurrying cheerfully into the breakfast-room, rubbing his hands and humming a tune, was greeted, and checked in his genial flow of spirits, by the sight of his sister, seated, indeed, in her usual place behind the tea-urn, but bowed forward and sobbing unrestrainedly into her handkerchief." The implication here is that Haynes knows nothing about Pulteney's death until his sister breaks the news - as Ellen said, he is shown to be a man of "trembling nervousness". To behave with such equanimity after committing a murder (or paying the maid to commit it, as Howard suggested) would show an unbelievable callousness which does not go with his character as we see it. However, as well as the blackmail letter and the mysterious hanging tree, I still think there are suggestions of guilt in the comment about the heavy burden - and there is also the question of the voice he hears. We are never told whose voice it is, but as I read the story the first time I certainly suspected it was Pulteney's voice whispering in Haynes's ear "distinctly and with a peculiar emphasis". It may be, as Judy says, "Mine is a heavy burden" is Haynes's rationale, though again in the story it seems (as the narrator tells it) that Haynes did not know the Archdeacon had been embezzling funds, not doing his duties, neglecting the church and the rest of it. "A considerable space in his journals is occupied with exclamations upon the confusion in which Archdeacon Pulteney had left the business in his office and the documents appertaining to it. Dues upon Wringham and Barnswood have been uncollected for something like twelve years, and are largely irrecoverable; no visitation has been held for seven years; four chancels are almost past mending. The persons deputized by the archdeacon have been nearly as incapable as himself." However, it seems quite likely to me that Haynes is surprised at the extent of the neglect rather than the fact of it. He has after all been living in the same house as Pulteney and working in the diocese alongside him, and must have been aware that the business of the church has not been carried out quite as it should. A letter from an unnamed friend describes how, the last time he visited Pulteney "there was no single paper that he could lay hands upon, no syllable of mine that he could hear, and no fact in connection with my business that he could remember". I think suggestion here is that Pulteney was suffering from some form of growing dementia, something of which Haynes must have been all too well aware - even without the opportunity to inspect the paperwork himself. I also feel there could be pointers to guilt in the way in which Haynes manages to stay cheerful for about three years after the death, the time he needs "to set the business of the Archdeaconry on a proper footing" - but then starts to become increasingly depressed and to fear the dark. It seems as though, with the urgent work out of the way, it becomes increasingly impossible for him to shut out the reality of what he has done, to convince himself that he "acted for the best". On the other hand, this could be a pointer to just the opposite - the faithful way in which Haynes does his work could suggest that he is innocent and that the growing depression comes from fears of his own death (he becomes increasingly interested in attending religious services at this time) rather than memories of Pulteney's. The ambiguity is still there.
" 'Oh, I forgot,' said he. 'The old man told me it was so ugly and frightened his children so much that he burnt it.' "
This comes very forcefully at the end and seems as if it ought to cast a new light on what has gone before, but I can't see how it does this. I'm also wondering why James chose a cat for the spectre - perhaps because it walks in the dark and stalks its prey? Does anybody have thoughts on either of these aspects? Re: "The Stalls of Barchester Cathedrale": A Witch Story? Judy has gone to the considerable trouble of picking out the various passages which provide good evidence that Dr Haynes did not kill the Archdeacon, and thus belongs to the configuration of the vulnerable, sensitive victim who is chosen for torment because by chance he or she ends up in a place where a malign spirit lurks or a crime or malign things have been done, over subversive, anti-social -- the Archdeacon embezzled. Again and again ghost stories swirl about some irretrievable bad thing happening which cannot be undone and for which justice has not been achieved. Again here's ambiguity because the lack of justice could be the murder of the archdeacon. Still the evidence against this notion is obvious and clear. I like how she also suggests how what we are shown makes the suggestion that the maid did it because she was paid a seeking for explanation which is not in the story at all. A stretch. On the cat: to me the creepiest most uncanny moment in the story is when the statuette turns into a cat. Again slowly we are made aware a cat is sitting near, then haunting, then stalking Dr Haynes. The state of the body suggests the tortured murder and mutiliation of Haynes's body was done by the cat. It was the cat that remained in my mind when I closed the book, the cat I was afraid my mind would conjure up. Many of these ghost stories are told by a first-person narrator whose credibility we begin to suspect by the end of the story. Often too there are narrators within narrators: someone is presenting a series of documents left by someone else. We had that in "Green Tea". Pat mentioned Bierce: Bierce's "Moonlight Road" is a series of documents presented by an unknown narrator. My view is partly that the narrator shows himself to be more than a little obtuse, comically so. James is making fun of the dry-as-dust scholar (i.e., himself). Judy also points out how Dr Haynes could be conjuring the cat and the devil-like king with prick-ears and claws up as dream figures after looking at that statuette too long. The trouble with that is the body -- there was a body and these were the signs left. Also Allen who can be read as the usual nervous person trying to explain the unexplainable, put it in a box and close the box -- he saw something and hastily decamped with words covering up what he saw -- except for that line about the wild ferocious cat. Judy asks about the final line which is forceful. I saw it as ironic: the statuettes are gone; all evidence of what happened removed. I wasn't sure the wood piece was of the cat; it could have equally been a piece from the king-like figure with pricked ears and claws. All we have for sure is the wood were "still extant pieces". Still taking it that the cat is central -- for the king-like figure's prick-ears and claws are visibilia of cats -- why point this up at the end? The question is, What did it? What kind of supernatural phenomena did Haynes in? that this is the question is signalled by the verses which offer one kind of explanation. Why is this of interest? Well, in mythic lore the vampire and werewolf stand for certain kinds of emotions, while a ghost stands for another, often a compound made up heavily of guilt and/or hatred & revenge. There are also witches in folklore and the kinds of stories which have witches in the center are not paradigms of retribution (of evil, guilt, and justice). In stories of witches there is none. The human being is just loathed, hatred; the witch is a malign trickster. Could it be that Haynes has been haunted and destroyed by a witch? cats are part of the visibilia of witches. The illustration by Caldecott in my volume of M. R. James shows a seated statuette which has a werewolf kind of face -- very thin. If it's a witch, we don't need to ferret about to find out that Haynes did anything. Who grows in the wood and is watered with blood? It could be pagan figure, but also a witch -- or werewolf. The murder is very brutal, and such brutality often signals a werewolf. Ghost stories often end with the corpse presented in ways that leave us much room to think the person just committed suicide. Hung him or herself; the verdict at the end of "Green Tea" is suicide; so too do we have a possible child suicide at the close of "Shadow in the Corner". Or they simply remove the person and we never see them again: that's "The Lost Ghost". We have another of these on the way. About two summers ago I read with a class a story by Christopher Woodforde; his years were 1902-1962 and he wrote that he admired M. R. James; he was an amateur scholar-antiquarian -- using the word in its original positive sense: he wasn't paid to do the work he did (didn't get promoted based on it); he was a curate. We read his "Cushi": the problem with this story is it doesn't make sense if you think Cushi is a ghost for it's hard to find a murder or guilt or some paradigm of justice -- as in a way we have to look for it in "The Stalls". But in "Cushi" there's really nothing to be found. However, once you realise Cushi is a witch, you can provide an explanation in the sense that you don't need one. In gothic stories witches are often sadistic, malign creatures, half-mad. Psychologically this is a projection of the male fear of strong women, and the mythic idea that old ugly women want revenge on the world for being neglected and despised. If it is a witch-story, then we have the fear of the female in it. Dr Haynes's sister removes herself: she was not always with him we are told. Did he need her protection? I own a book which goes over the traits of supernatural beings; it's really very good: Peter Penzoldt, The Supernatural in Fiction goes over the traits of supernatural beings in such fiction. Penzold't book is old-fashioned, written in the 1950s, but you often find it cited on bibliographies. I find myself returning to it repeatedly - that's why I bought it. I first took it out of the GMU library. Penzoldt's description of the werewolf and the brutality of deaths associated with stories which feature werewolves made me think this is a hidden element in Dr Jekyll and Mr Hyde: Hyde has features in common with werewolves. Especially the hairy hands. So maybe, just maybe, this is a story about a witch and witch-like magic. The removal of the statuette, the trick of removing the stair rod, the cat, that cat. And then witches are said to be so terribly ugly. It's another kind of tease at the end of the story. What was it did Dr Haynes in? He should not have crossed that barrier; he should have minded his business, not investigated things, not gone into the church to study what was there. James did not always write ghost stories, and he doesn't announce what the creature is necessarily. Not until the end of "An Episode of Cathedrale History" is the reader sure the supernatural presence destroying everyone and everything, so fearful, is a vampire. The alert reader might get it for the second time through after reading the inscription on the monument can find evidence for the presence not being a ghost but a vampire. The inscription is in Latin: "Ibi Cubavit Lamia" (Here lies a vampire). This monument is also in a church, towards the back, unnoticed until someone decides he is going to renovate the cathedrale, modernize it. But the first time through it's not easy (as in Emma where we are fooled the first through and the second time through is interesting as we see the clues we missed). We could see "The Stalls" as built like "An Episode of Cathedrale History". I have learned far more about the story than I would have had I just read it on my own. This has been very enlightening and enrichening. I thank Judy especially but also Howard and all those who wrote about it. "Jan 10 - Allen and I in the library until 11. He left me twice to see what the maids were doing in the hall: returning the second time he told me he had seen one of them passing through the door at the end of the passage, and said if his wife were here she would soon get them into better order. I asked him what coloured dress the maid wore; he said grey or white. I supposed it would be so." The terseness of this makes it sound important, but I don't really understand why. At first reading I think I jumped to the conclusion that the maid was a ghost - but this doesn't make sense since she is still alive. Any thoughts on this, anyone? I want to say something about the similarities between this story and our tale, but this will involve posting spoilers for 'Canon Alberic', so if you haven't yet read this story and would like to, please don't read on. In 'Canon Alberic's Scrap-Book' it seems to me we don't have the ambiguity which is there in TSOBC - the demon unleashed by the ancient book does exist and has been seen by several people. It is no creature of the narrator's brain. The ancient sacristan is keen to sell the book, even at a ludicrously low price, in order to pass on the curse to somebody else. This reminded me of Robert Louis Stevenson's 'The Bottle Imp' where the hero buys a bottle carrying a curse, and has to sell it to somebody else to be free of it. But, to get back to James, reading this story gives strength to the idea that the cat in our tale could be a similar type of demon, which is unleashed by the carving and goads people to death. We are not given any explanation as to why the stalls were removed from the cathedral, simply the bald statement 'the woodwork in question has now disappeared'. James leaves us to wonder why it was removed and broken up and taken to the woodyard. In 'Canon Alberic', we are told that the book containing the demon has been burnt, and this has now got rid of the curse. This seems to suggest a possible explanation for the burning of the carving at the end of TSOBC - if it also carries a demonic cat which haunts a series of victims it in turn, then the old man's children had every reason to be frightened. 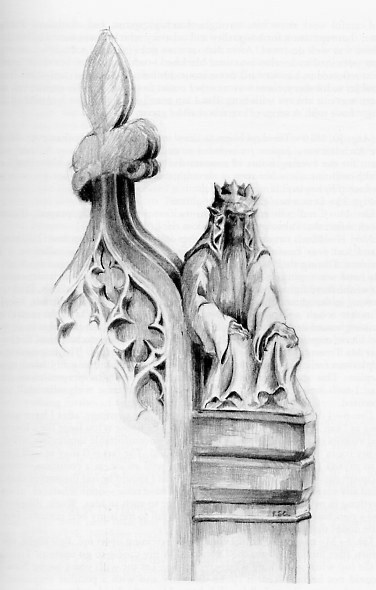 Re: "The Stalls of Barchester Cathedrale" and "Canon Alberic's Scrap-book"
The image of the "grey lady" or "grey woman" is one Gaskell uses in a story called "The Grey Woman". I have come across exegeses (where I can't recall just now), which attach the image to witchcraft and witches. The story or legend upon which Gaskell based her fiction is savagely violent and about how "the sins of the fathers" are visited upon the children. The sins of one generation visited upon the next? I don't remember Gaskell's story any more beyond this. I shall have a look at Canon Alberic's Scrap-book. Ellen Re: "Canon Alberic's Scrap-book"
I just read this one. Oh dear. Fearful vision, ever so quietly appearing. There is a link here: we seem to have demon in this "Scrap-Book". I can't think just now of a ghost story which ends with burning of an object; however, some of the vampire tales do end with the destruction of the paraphernalia surrounding the vampire, and perhaps this includes burning. A thorough going-pulverization ends Le Fanu's "Carmilla". I like how she also suggests how what we are shown makes the suggestion that the maid did it because she was paid a seeking for explanation which is not in the story at all. A stretch. I just had an "aha!" moment! Could it be that the maid, seeing that Dr. Haynes chafed under the incompetent elderly archdeacon, took matters into her own hands, expecting to be rewarded for her efforts? This would explain the new archdeacon's payment to the maid which looked so guilty. As nervous as he was becoming, he could have feared that he had given some encouragement to the maid. Yes, I agree it is a fearful vision, and it seems to have a lot of similarities with 'The Stalls of Barchester Cathedral' - there is the same feeling of evil within the setting which should be holy, the ancient church building and apparently sacred carving or manuscript. I suppose the burning carries a suggestion of hellfire, as the demon is sent back whence it came. Thanks for the information about werewolves - looking at your explanation, the demon in this story seems to have certain werewolf characteristics, as does the large cat in TSOBC. Re: "Canon Alberic's Scrap-Book" In response to Judy and anyone else tempted to read this vignette (it is so short), I confess I again felt frightened. My sense is that it's the very quietude and ordinariness, the suddenness with which the vision steals on us -- and it hideousness -- that makes for the strong affect (I mean the "a") of this story. One -- or I -- really felt it's a matter of my own mind: I could turn around and there it'd be. The true uncanny is more than domesticated supernatural. It's not just psychoanalytic, and it's so vividly seen. I enjoyed "The Stalls of Barchester" very much, and the posts here even more! Does anyone on the list remember a film called The Wicker Man? It is an English film, and it came out in the 1970's. I love that film! Without giving the story away, let me summarize the plot. The film takes place on an isolated island off the northern coast of England. The inhabitants there have gone back to the old pagan forms of worship. A police officer from the mainland comes to investigate the death of a young girl. Then things get nasty. The natives of the island celebrate traditional holidays like May Day in traditional ways, but these traditions are far from quaint. The myth of the Corn God who must be sacrificed every year as part of the yearly cycle of birth/death/rebirth and spring/summer/winter is a central part of the plot of The Wicker Man. The opening sequence of the film is lovely - a shot from the airplane crossing the water to the island. The folk song "Corn Rigs are Bonny" is played under the opening credits, and is a recurring motif in the film. The song, and The Wicker Man came up on one of the Austen lists within the past year or so. Someone even posted the name of the CD where one can find the song. Drat! I lost the post. What does this have to do with "The Stalls of Barchester"? Several things. First of all, the image of an evil tree watered in blood reminded me of the legend of the Corn God. A tree is watered in blood. That can make the tree sacred, or evil, or perhaps both. Secondly, we are in the solstice period right now. Our ancestors must have feared this time, with its short cold days, and rejoiced as the days grew longer. I felt a primitive sort of fear when I read "The Stalls of Barchester". There are some folks who say that Christian customs overlay pagan ones. (Christmas is a festival of light and rebirth, Easter is a feast of death and rebirth.) The inhabitants of the island in The Wicker Man decided to rid themselves of Christianity entirely and go back to the "old ways." The "Christian copper" who is lured to the island and clings to his Christian faith until the end, comes to grief. The primitive ways overwhelm him. The Cathedral in Barchester is a bit spooky. Have all the old ghosts and old ways really been extinguished? The very wood in the Cathedral contains ancient, mysterious powers! Thank goodness for electric lights, hot buttered muffins, and cozy flannel nightgowns. These modern connivances have sheltered me from bone-chilling fear as I read the Ghost Stories, and look out my window at a low, menacing winter sun that hardly rises much into the sky before it sets. Thank you all, for a wonderful Solstice! If you want to see The Wicker Man don't watch it alone! I found this a powerful tale, and agree with Ellen and Judy G that it is unusual amongst ghost stories. I was thinking about the Moonstone that there is the suggestion all through the book that the diamond could be broken up and made into smaller gems and thus lose its potency. No one does this despite it often occuring to those who hold it. Like the Monkey's Tale, the magic in question is so strong we do not question why it works only look on in horror at the consequences. There is a Charlotte Mew tale about a church where a group of travellers find themselves shut up by accident over night and witness a woman being imprisoned in the vaults by monks. In the morning they find no trace of this activity. Very gothic. Do others know of the works of Charlotte Mew? I love her morbid tales and poems. She also had a passion for London street trees and could not bear to see them cut down. "There is a Charlotte Mew tale about a church where a group of travellers find themselves shut up by accident over night and witness a woman being imprisoned in the vaults by monks. In the morning they find no trace of this activity. Very gothic. Do others know of the works of Charlotte Mew? I love her morbid tales and poems. She also had a passion for London street trees and could not bear to see them cut down." I have never read anything by Mews but I have colleagues and friends who have and liked her stuff very much. The above tale sounds effective and interesting. Let's keep Mew in mind for a Victorian read -- or next year :). I tried to initiate some good conversation on Gaslight about "The Stalls" by posting a version of what I put on Trollope-l about "The Stalls." I'm posting the thread that emerged as an object lesson about the problems of talking about books online together as well as for the genuine content about the story. I read Peter Wood's first reply to my attempt at a close reading of M. R. James's ghost story, "The Stalls of Barchester Cathedrale" a few hours after I sent it -- but on another account I have where the emails come in separately. I have been waiting for my digest on this account where I can type from home, but it seems not to be coming through. Lest I appear not to be responding I will do so now though I haven't got his in front of me so only remember the angry derogatory term "self-serving" -- applied to my posting. Why I can't tell. He objected to one aspect of my reading which I will here defend (mildly I hope) by saying that I was doing what many literary critics and scholars have ever done: reading the tale from a perspective relevant to our world today and as I see it. My reading was one consonant with what many critics and scholars of ghost stories and gothics have been writing since the Edwardian era and if one wants to see it set out in learned language with much documentation to support it as genuinely rooted in the disquiets of the Edwardian era one need only go to Jack Sullivan's Elegant Nightmares. Sullivan is but one voice that takes the same line. We did on Trollope-l have some good talk over this story where people produced other readings, one of whom tried to show that in the text there is evidence that could suggest Haynes is guilty of the crime of murder, but then again someone showed that to be ambiguous and that at any rate the punishment was far out of proportion to the crime if there was one: human beings do not torture one another, do not savage one another to death. At least not those who are humane and enlightened. I was thinking of some analogy to the metaphysical and philosophical inferences to M. R. James's story (and others of a similar type which I mentioned in my email, e.g, Le Fanu's): Sullivan remarks that this genre of gothic and ghost stories are expressionistic and he goes for "high brow" equivalents in prose (Kafka). I'll instead allude to a poem I saw put onto the Net the day after September 11th: Robinson Jeffers's "Apology for Bad Dreams". I did remark that whether or not Haynes actually committed the crime was not important -- at least as I read the story; what was important was the ferocity (and I'll add now malignity) on the other side of our comforting realities both hinted and dramatized at painful and uncannily psychologically fearful albeit quiet way in James's story. I think Jeffers's poem articulates the central insight which gives rise to "The Stalls" if in a different and graphically violent mythic way. I can't help but say also that a response to literary interpretation which is rooted in personal offense shows us once again why group conversations in cyberspace over texts often end in quarrels irrelevant to the text at hand. While I suppose we are all well aware that two people's response to an email does not stand for a whole list -- nor 10 nor 20 but those who are active have the effect of "standing for" the whole, the psychological and cognitive realities of group dynamics in cyberspace explain why quarrelling and (even when only briefly) acrimonious email responses have the effect of putting an end to such conversations. The result: members of email lists pretend to be having discussions rather than actually having them, so that after our listowner's and other members' genuine hard work and well-meant efforts this list is mostly silent. I regret trying to have a disinterested discussion of any literature on this list. I do not agree with certain of the above conclusions. In brief, the Reverend Archdeacon Haynes committed murder - indirectly, but none the less effectively. As such, he laid himself open to the justiciars that the three figures in the stall-ends represented - Vengeance, Death, and the Devil. The late Archdeacon Pulteny equally deserved his end; he had not rendered unto God the things that were God's (the Cathedral has not been maintained, the tithes that were its income had not been collected, and Church discipline had not been maintained). We do not know what punishment he might have incurred in the next world for his neglect of his duties, but in this world he received a death sentence, by the hands, or rather at the instigation of his successor). However, that the late Archdeacon Pulteny's end may have been deserved does not exempt his executioner from justice for *his* crime (the public executioner must answer for his killings in the next world, despite the fact that such was his paid duty). I agree that the God we see here is a harsh one, but there is no justification for the self-serving modern view that the Creator is otherwise, save the ever-present flabbiness of spirit which would be only too glad to receive at most a gentle reprimand on the Day of Judgment for a life of self-indulgence and deliberate self-seeking. As to the cat; if, as we read: "the Devil goeth abroad as a raging lion, seeking whom he may devour" (First Peter, 5:8), there seems no reason why a cat-spirit should not do the same. There is a very interesting note on the Latin inscriptions on the whistle in "Oh Whistle..." in the book "A Pleasing Horror" an anthology of M. R. James's ghost stories, published by Ash-Tree Press, 2001, ISBN 1-55310-024-7, which I can whole-heartedly recommend as a belated Xmas gift, or as an early New Year one. As I do not seek to impose my religious opinions - which I have not so far stated - on anyone else, I see no good reason why I should be concerned if they seem "dismissive". I would be glad to hear *your* opinion why I should, though I cannot of course guarantee I shall accept them as valid. My religious views have been formed over some sixty years, after considerable reading and discussion with adherents of many faiths, creeds and sects. As far as Christianity is concerned, my view on much of what passes for it today is that many of those who consider themselves Christian in their beliefs should read the parable of the sheep and the goats carefully and think it over. Another good story to read would be "A Vision of Judgment" by H. G. Wells. As one who has no fixed views on the nature of the Creator, save that anything capable of creating the Universe in which we live (and perhaps an infinite number of other ones), whether we call it He or She or It, is so far beyond our comprehension and understanding as to be unknowable by human intellect, I am as always prepared to learn more with time. If there *is* an afterlife and a Final Judgment, I am prepared to stand on my record - indeed, I shall have no other option! If there is no such thing, I do not see what there is to worry about. In the meantime, I shall continue to use such terms of discourse as I see fit. The Bible's language is somewhat stronger, I fear (see Revelations ch. 3 vv. 13-16 on the Laodicean Church as an example). A final question. It seems to me that today it is accounted wrong to have a strongly-held opinion and to state it openly and forcibly, lest it may hurt or distress others. If we cease to express opinions, all too soon there will be no opinions to express, and a universal blandness will engulf us all. Is this possibility acceptable? I agree that the God we see here is a harsh one, (but there is no justification for the self-serving modern view that the Creator is otherwise, save the ever-present flabbiness of spirit which would be only too glad to receive at most a gentle reprimand on the Day of Judgment for a life of self-indulgence and deliberate self-seeking). This remark was prompted by yet another article in our local newspaper from one of those writers whose views on religion I find so irritating, consisting as they do of equal parts of soothing syrup and universal sweetness - as the late John Lennon put it; "All you need is love", to which I can only cry "Rubbish!"... Moral: reply to what was said in the posting, not to some other peripheral matter. My point of disagreement with your comments, or rather my main one, was to question what occurred to the late Archdeacon Pulteney. In my opinion, to use a phrase I have heard elsewhere of late: "He had it coming". His successor, Archdeacon Haynes, was God's justiciar. However, he in his turn fell victim to another justiciary system; that of the figures on the stalls, who had the power to punish murder - clearly intended only for church dignitaries, as no-one else would have access to those figures. Pulteney would not be troubled by them as he had not committed murder ("...if a bloody hand he bear"). "Unfair! ", I hear someone say of this chain of death and presumably damnation. Not so, in my opinion, for though Pulteney deserved punishment for his sins of omission and commission (as I outlined in my previous posting), it was not Haynes's right to arrogate the post of God's instrument of vengence to himself ("Vengeance is mine; I will repay saith the Lord." (Romans 12:19). He did so, and in his turn paid the penalty. Such is my interpretation, and on it I base my description of God as "harsh". I infer we are to think that the Archdeacon was hounded in a manner similar to Dr Haynes but since he did not investigate and didn't seek to go beyond the barrier of this reality (was supine to parishioners too), he was left relatively alone. Simply bumped off, as it were, kicked downstairs. The accusation is a form of teasing the reader. Given all we know about Dr Haynes it is absurd. So too the blaming of the maid - though we begin to wonder about who she is connected to, how. These are forms of teasing, like the explanation of green tea for Mr Jenning's experiences, though rather more transparently inadequate. Again, I must disagree. That last sentence is a circular argument. People *do* torture and savage one another all around us, everywhere, every day. I believe that we are all capable of such acts, given sufficient provocation and in the right (?wrong?) circumstances. We live, move, and have our being on a thin crust of civilised behaviour above a boiling sea of savagery, and it takes all too little for that dividing partition to give way. Sorry if this is long, but I was distracted from the original discussion by that unfortunate young woman who felt affronted by my uncompromising attitude to modern soft-centredness in religious beliefs. Well we agree in the sense that it does not matter very much whether Haynes murdered or paid someone else to murder the Archdeacon -- though I would maintain there is much in the story to suggest he did neither and not enough to prove he did. It is the ferocity on the other side of the barrier that counts. I don't have a soft or flabby view of the forces or powers that make up life: indeed I find them harsh and bleak. It does seem to me you are reacting very personally to Dr Haynes. I've never met this type of academic of which you speak so confidently -- perhaps they tend to be in "high level" Ivy League schools in the US, insulated by their original background, or at Oxford and Cambridge or other English backwater places of privilege. No one ever destroyed me; I could never get anyone to give me a full-time job because they were all ruthlessly clawing at things and did not at all persuade themselves they were moral. In fact I didn't fit in because I thought myself moral. I come online because I am isolated and alone; if it were not for my husband's salary, I'd be on the streets; if it were not for him, I'd be in an asylum. I probably should not have had my third paragraph but it is so dismaying to me to read Gaslight digests nowadays. See above for why online groups mean much to me. And I think the silence there is the result of personal responses especially short dumb ones like that woman's to attempts to talk about stories disinterestedly. I have no personal investment in the interpretation I came up with and it was only one small part of two long postings. I guess I will now retire in defeat; I will try to keep Robert Louis Stevenson's comments in mind: our task is to carry on failing in good spirits. So I hope we maintain our cordial relationship. Nevertheless, gentle reader, I never again tried to talk about any stories in depth on Gaslight.